Help, My Baby Takes Too Long to Burp! My baby boy is almost 2 months old.? He is my 3rd child, so I pretty much know the ins and outs of being a mom.? The hardest thing for me right now is definitely the lack of sleep.? But one thing I hardly ever hear anyone talk about is BURPING. What a struggle it is after spending so much time feeding the baby and then anticipating a burp.? Five minutes – pat pat pat, Ten minutes – pat pat pat…..? still no burp.? I try everything – changing positions from shoulder to shoulder, having him sit up on my lap, laying him on his tummy over my legs, and back to the shoulder again….? still no burp. It just about kills me at 2 in the morning after the baby drinks an entire 5 ounces and I can’t get a burp out of him.? I am half asleep and fighting the urge just to put him back in his bed and forget about it.? 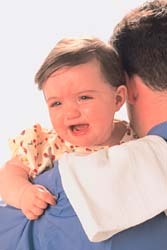 I have done this on a few occasions and I suffered the consequences of having a very gassy baby.? Not Good! I researched quite a bit and did not find any particular “secret” to burping.? Most websites listed the 3 main burping positions and suggested trying all of them until the baby burps. They also said that some babies will like certain positions better.? But MY baby just seems to be a HARD TO BURP BABY.? I have tried it all! I also read that breastfed babies have less gas than bottle fed babies.?? Bottle fed babies somehow get more air when feeding.? A trick to help with this is to feed the baby in a more upright position. I would love to hear your suggestions.?? I am desperately in need of some good advice in the burping area.? HELP PLEASE!! I worried alot about if I would be able to burp my baby properly during my pregnancy. I began to ask questions, and read books about how to burp babies. None of the techniques eased my mind. I learned about Dr. Browns baby bottles at our Baby Shower one month before my son was born. I was blessed to receive several of Dr. Browns baby bottles “Natural flow” it prevents the infant from swallowing air, my baby burped on his own. We never had to use any other techniques. It was scary at first, because you’re told that you have pat the baby on the back, and all the other techniques above. I have been an advocate of Dr. Browns ever since!